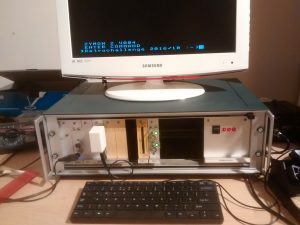 In my last two posts I wrote about how I made an adapter for my 1980’s Interak-1 computer so that it could make use of USB keyboards as the original Alphameric keyboard had failed. 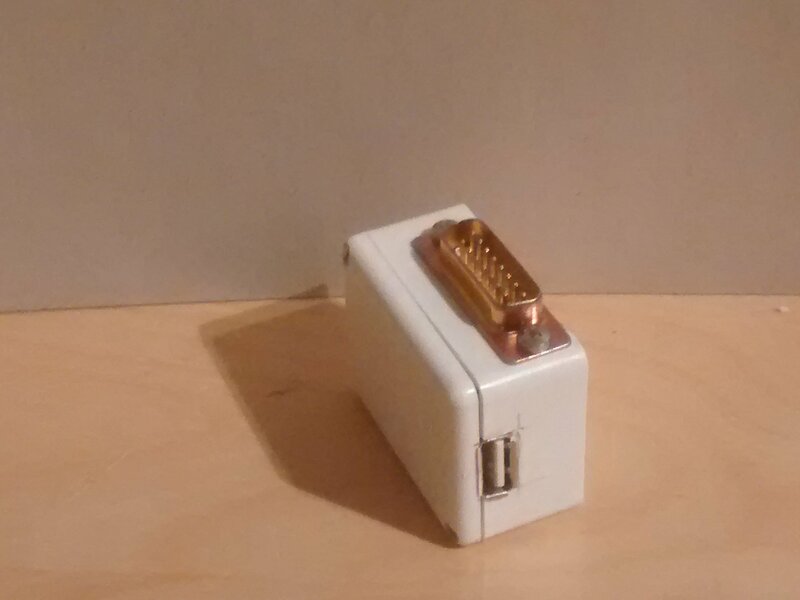 Those posts were a bit rushed and the adapter was still a work in progress. 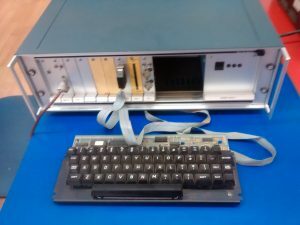 It’s finished now and so in this post I’ll try to tell the full story and in more detail so if anyone else has the need for a USB keyboard to 7-bit parallel ASCII keyboard they will have something to follow. The Interak comes from an era before USB became ubiquitous, when a parallel cable running from a semi-intelligent keyboard to the main CPU was commonplace. With these keyboards, when a key is pressed, the binary representation of the key, in ASCII, is presented on seven data lines. 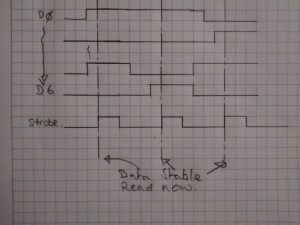 An eighth bit called Strobe is then pulsed high (5V) and then low (0V) to indicate to the CPU that a character is ready. Sadly, the keyboard that came with my Interak had developed a fault and several columns of keys didn’t work at all. I tested the socketed chips with my IC tester but they seemed OK and so I suspected the micro-controller and I didn’t want to go too far down that road and so I decided to do away with the original keyboard. I looked around for a while and found a number of solutions that will use PC keyboards with the PC-mini-DIN connector but they haven’t been mainstream for over ten years and I didn’t want to end up with the same problem later. USB is the way to go. When USB is the solution… Crikey. 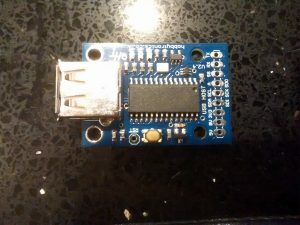 In all honesty, I don’t know a great deal about USB and the though of writing a USB host to interface with a keyboard seems like no kind of fun (Retrochallenge is meant to be fun) and so I looked around for solutions and found HobbyTronics who produce a small USB host board that just needs 5v and will produce a serial output. 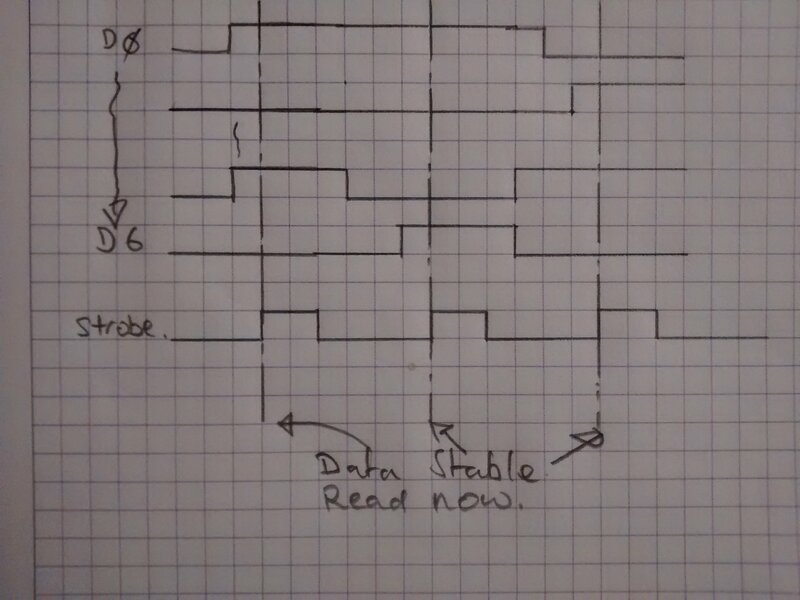 Although a serial stream isn’t what’s needed, it is easy to pipe it into an Arduino and get that to output the ASCII in parallel on its IO pins. I made a prototype using an Arduino UNO connected to the Hobbytronics board. To make debugging easier I used a software serial library to keep the hardware serial port free. More on that later. The Arduino UNO worked very well. Well enough to convince me to use a small Arduino Pro Mini and make the thing real. The Interak uses a 15 way D type on the front for the keyboard connector and so I soldered the Pro Mini as close as I could to the connector and the the three wires to the USB board. So there you go. My beloved Interak has a new lease of life. There is a nice little addition waiting in the wings here. 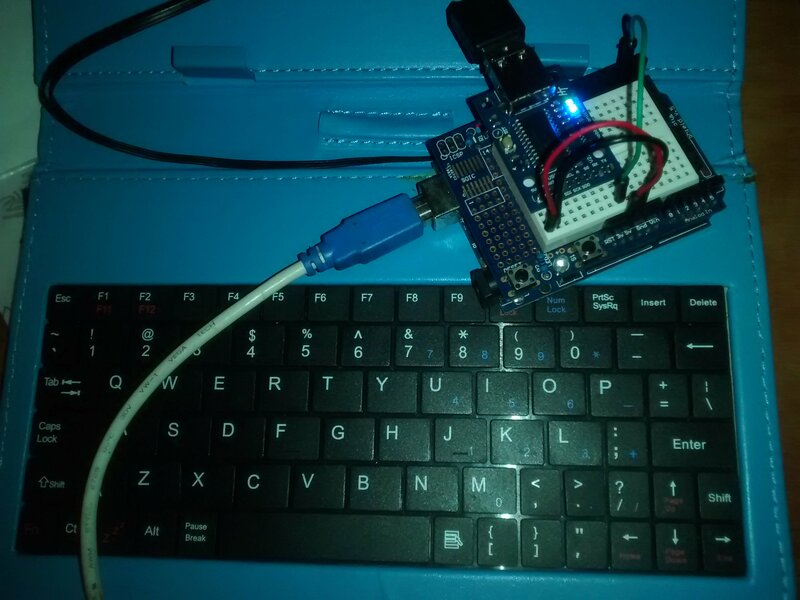 The Arduino has another serial port, the hardware one and so It would be quite easy to add the standard USB to serial board and then the Interak’s keyboard port would appear to my PC as a serial port and I could squirt data into from a terminal emulator. There would be no handshaking and so I’d have to artificially drop the data rate with delays but it would work. * This code is free to use. DDRD = DDRD | B11111100; // Using d2-d7 as output. Saving d0-1 just in case. Pleased to see her working again, shame the original keyboard didn’t want to play ball but a nice fix that removes the need for a potentially difficult to replace part. 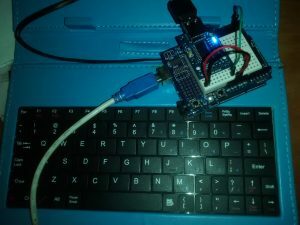 I would love to have a similar device that allows the use of a modern USB keyboard on a 1990’s ADB interface Apple Macintosh. That’s a great idea. 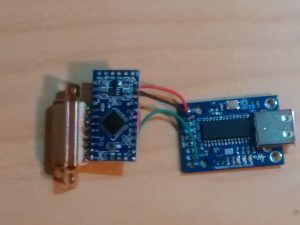 Take a look at big mess o’ wires’ USB to ADB adapter. It’s a work in progress but looks promising.